The rigorous and broad-based crackdown by the Chinese government on capital flight, and particularly on overseas investments in risky real estate by over-leveraged Chinese conglomerates, is reverberating through the priciest trophy office market in the US. CommercialCafé explains the phenomenon: “The last three months of the year also seemed to confirm what industry experts had predicted for a while: given the increased scrutiny exerted by Beijing on outbound investments, Chinese buyers are disappearing from the U.S. office limelight." 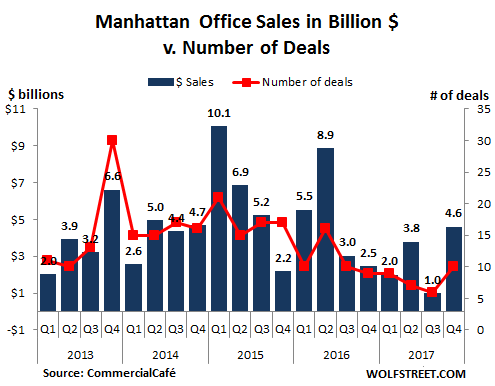 CommercialCafé, a division of Yardi, used Yardi Matrix data to analyze all Manhattan office transactions recorded by January 1st, 2018, of $5 million or more, and larger than 50,000 square feet. In the case of mixed-use properties, only those with over 50% office space were taken into account. 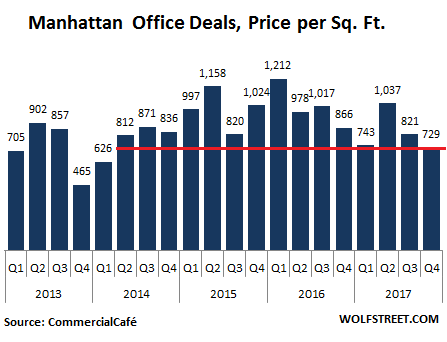 After the frozen-over Q3 when only 6 large office deals closed totaling a paltry $990 million, Q4 experienced somewhat of a thaw, with 10 large deals, totaling $4.6 billion. For the entire year 2017 – which eliminates the quarter to quarter volatility – the average price per square foot came in at $784, below the average of 2016 and 2015, according to CommercialCafé. Everyone is now missing the Chinese buyers. And their absence was very sudden. It wasn’t all Chinese money though. 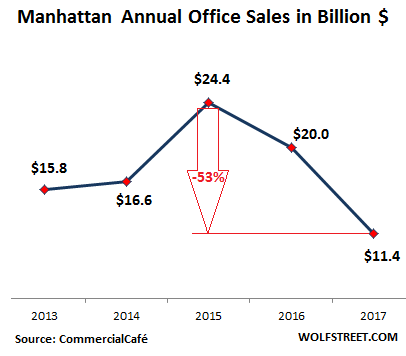 As I wrote at the time in my report, “What’ll Happen to US Commercial Real Estate as Chinese Money Dries Up?” the purchase of the 45-story tower was funded by a $508 million loan from a consortium of Western banks, including JPMorgan Chase, Natixis, Deutsche Bank, Barclays, and Societe Generale. The rest was funded by HNA’s other lenders, presumably in China. By comparison, Chinese investors were conspicuously absent from the buyer roster in Q4, which was to be expected, as Beijing increased its scrutiny of offshore real estate investments in 2017. There were only two office deals closed by Asian buyers in the year’s fourth quarter, and neither one of those buyers was from China: Japan-based Unizo Holdings acquired the property at 685 3rd Avenue for $468 million, while Investcorp, headquartered in Bahrain, paid $157 million for the building at 229 W. 36th Street. Thus, the biggest trophy office market in the US leads as an example of what happens to the dynamics of that market without the ravenous and blind appetite of Chinese buyers trying to buy trophy properties at the fattest prices for reasons of their own and to the greatest delight of the sellers.